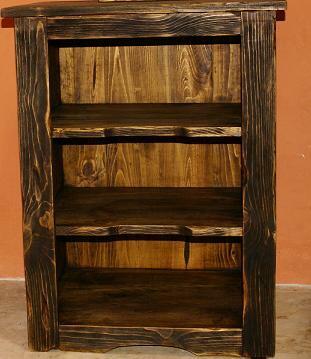 Zin Bedside Table in dark pine wood is a practical, sturdy, no- hidden-secrets addition to your Mexican bedroom decor. What you see is what you get. This nothing-hidden, simple and functional bedside table helps you to stay minimalist, organized and open. We recommend accenting it with a beautiful piece of Talavera pottery on the second shelf, to add to its visual appeal. Shown in dark stain, the beauty of the knotted pine is charming and wonderfully rustic in this piece. A night table with true openness and presence.